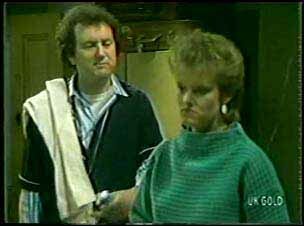 Helen and Jim have dinner with Richard and Maria, but Max turns up in the middle of it. He isn't pleased. Max rants at Jim for lying to him. He accuses them all of laughing at him behind his back. Jim gets up and shouts at Max for being self-centred and if he had any decency he'd leave. Max points out that it's his house (and to be fair - he's right!) 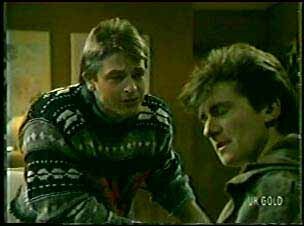 Richard tries to intervene, but Max tells him not to interfere. He stalks out, but has calmed down a bit and tells them all that he's sorry. When Max, Jim and Helen have gone, Maria starts to cry and apologises to Richard. He tells her to forget it. Danny is watching the proceedings from Des's window. 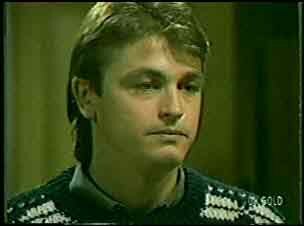 He thinks Richard should leave them all alone, but Des says that if Richard loves Maria he'll stick around. Danny says that Max and Maria still love each other, but Des thinks that's gone now. If they got back together they'd only argue again. Danny says he just wants to see them together again. 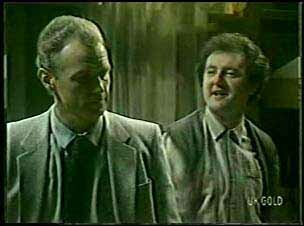 Des tells Danny about when Malcolm left them - there's nothing the kids can do. Danny doesn't want to hear this. Jim and Helen have arrived home. Helen says that Jim and Max should never have been fighting for this long - now Jim has given Max an excuse to carry the feud on. Jim says he's sorry for the way he spoke to Max earlier, but doesn't know what to do about it. Helen suddenly twigs that it must have been Danny who asked Max to come round in the first place. Jim has come to see Max. MAX: Well, if it isn't Judas himself! Max doesn't want to make up with Jim - but Jim says he wants his say. He apologises to Max but tells him that he'd better lift his game or he'll lose his best mate as well as his wife and home. Max yells at Jim for being sanctimonious. Jim shouts back that he came round to apologise, but he's not going to bother now. He stalks out. Richard and Maria are cuddling on the sofa. Richard tells her that they have to talk about things. He loves being with her, and wants to make tings more permanent. In fact, he wants to marry her. Maria doesn't say anything. Finally she says that she can't because Danny would be apopleptic with rage. Richard suspects that Danny is behind what happened tonight. He tells Maria to take off her blinkers and see how Danny is affecting them. Des is watching the cricket. 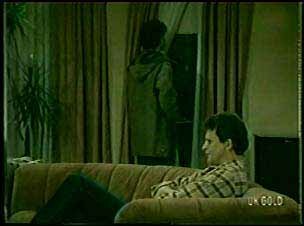 Danny is still at the window and is pleased to see Richard departing. Daphne comes in and Des gives her a big hug. Shane carries her stuff in - she's very excited to be back. 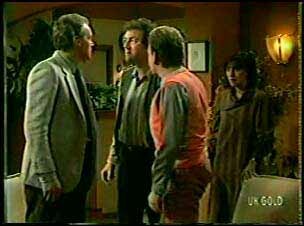 Shane asks Danny why he's hanging out at Des's - and that Jim and Max have had a fight. Maria is cleaning the carpet when Shane and Danny come in. Maria thinks Danny was the one who sent Max round too. She yells at Danny for not giving Richard a chance. Also for ruining Max and Jim's relationship. She shouts at Danny to get out. DANNY: I only did it for you. Not that you care! Danny tells Maria that he doesn't like Richard, but Maria says she just wants to be happy. She says that she gave up everything for Danny. 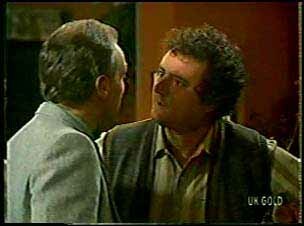 Shane tells Danny off for his behaviour. Danny says he didn't mean for Max and Jim to fight - he wants the family back together. He wants things back as they were. Danny says that he doesn't fit in anywhere - not with Max and Shane and not with Maria and Richard. He stalks off to his room. Shane comes in and tells them that things are bad at the Ramsay house. Daphne suggests a picnic tomorrow. He heads off to give a driving lesson. Des is suspicious at the late hour - but Daphne says the woman Shane is teaching works shifts. Anyway, she trusts Shane. Shane and Liz are having a drink. He makes out that he's a single bloke - he just "hangs out" with Daphne as friends(!) Liz invites Shane back to her place for a coffee. Oh dear, poor Daphne. Daphne heads off to see Shane. Daphne comes round to pick Shane up. But he isn't there and his bed hasn't been slept in. Max stutters and doesn't know what to say. Daphne realises that Shane didn't come home last night. MAX: Must have been a long driving lesson. Max tells Daphne not to worry - Shane might have dossed at a mate's or something. Just as Daphne is about to explode with anger, Shane comes in. SHANE: I didn't realise you'd be here so early.